The history of this US highway is complex. Over time it has changed names and relocated into another county. In Vernon county it was originally Hwy 26 in 1926. In 1927 it was renamed to Hwy 54 and routed through Vernon County, south to Cedar County, east through Polk County, north in Dallas County, and on northeast in Camden County. Today that would be similar to following Hwy 54 out of Nevada to Hwy 32 South in El Dorado Springs through Bolivar to Buffalo, taking 73 North to Hwy 54 just west of Macks Creek. That is quite a southerly detour from today’s current US Hwy 54. US Route 54 continued to be a mix of gravel, dirt, or crushed rock until 1932 when it was paved from the Kansas state line to Nevada, Missouri. 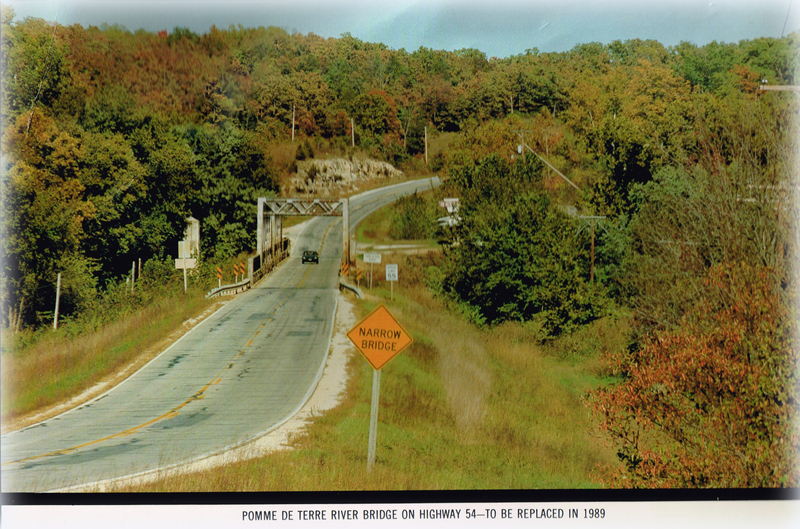 Major changes came to 1932 when the highway was rerouted and renamed in Hickory County. This was a direct line from Vernon County to Camden County and is the current highway course used today–with some minor modifications. In 1941 the final stretch of highway was paved between El Dorado Springs to Preston. In recent years, shoulders have been added between Hermitage to Macks Creek. Camden County was organized in 1841 and named Kinderhook, after the hometown of President Van Buren (Kinderhook, NY). In 1843, the legislation changed it to Camden, after the Earl of Camden – Charles Pratt. Linn Creek was the first choice of county seat because of the ease of steamboat transportation. In 1930 Union Electric had paid Camden County for the loss of their soon flooded courthouse. The Lake of the Ozarks produces hydro-electric power for Ameren UE, the successor of Union Electric, after the dam was completed April 1931. • Camdenton ‘Camden’ ‘town’ was built in part by Union Electric as the new county seat in 1931. • Macks Creek named for ‘Old Man’ Mack one of the first townspeople around 1830. More notably as the town with a clear stream winding into the Little Niangua. The town was made famous for the city’s speed traps along Hwy 54 and made 85% of their revenue from speeding tickets. This was an abuse of law enforcement power and the state set restrictions on the practice in 1995. Two years later all city officials resigned and without any future financial security. The town was dissolved by a majority vote in 2012. February 14, 1845 Hickory County was formed from Benton and Polk Counties and the first meeting of the county court met in a newly built Judge Joel Halbert’s stable. In 1956 construction began on the Pomme de Terre dam as a flood control reservoir by the US Army Corp of Engineers until completion in 1961. Beginning in the 1840s archeologists discovered mastodon and prehistoric animal bones near Avery (North of Wheatland). In 2012, a newly redesigned stilling basin at the Outlet Park was completed to make the area handicap accessible. • Preston was called “Black Oak Point” and renamed after a Civil War Union general, General Preston. A Preston steam flour mill was built in 1891 and tore down in 1968. Currently standing is a brick schoolhouse circa 1934 just south of the Hwy 54 and another historical building north of town (where the old highway ran). • Hermitage was plotted in 1847 and chosen as the county seat. First courthouse was built in 1848 and burnt in 1852. Another was built in 1860, the county population 4,510. In 1870 the stone jail was built and used until 1984. Steel cells were added in 1899 after a prisoner set fire to the jail’s wooden frame. In 1881 a brick church was built near the town square and is now home to the Missouri University Extension office. January 8, 1881 the second courthouse burnt. In 1896 the third and final brick courthouse was built to resemble the earlier courthouse design. In 1995 there was additional offices added to the courthouse on the north side. • Wheatland was plotted in 1869. • Weaubleau—originally called Haran in 1880 was a bustling town serving the area with freight and passenger train service. The Frisco railroad, originally operated by Southern Railroad, was extended through Weaubleau in 1890. The last passenger ride was May 27, 1954 and the freight remained operating until the 1970s. St. Clair County was organized in 1841 and named after Gen. Arthur St. Clair. The first courthouse was built in 1842 and burnt in 1861. The second courthouse was completed in 1867 and was fully vacated for safety reasons in 1908. The county was rebuilding the courthouse in 1916 when they were forced to halt construction until the debt was paid on a failed railroad venture. The voters passed a bond to pay off the debt and construction regained in 1920. The yellow brick & white stone trim was completed in 1923. • Collins current population 159 (2010 census) is the small community crossroads town. Cedar County was formed in 1845, named after Cedar Creek. In 1846 Lancaster was the first county seat of Cedar County. Lancaster was renamed as Fremont, for Gen. Fremont, in January 1847 and renamed as Stockton, in honor of Commodore Richard Stockton, in February 1859. First courthouse was completed in 1855 and damaged during the Civil War in 1863. The county lacked a courthouse until another was built in December 1867. The current day courthouse was built in 1940, where a copper box of memorabilia was placed into the cement floor. Stockton Lake was constructed when the Sac River was dammed in 1969, and supplies water for the City of Springfield via Fellows Lake. • El Dorado Springs was organized in 1881 and is currently the county’s largest city hosting around 3,600 “down-home-friendly” folks. Many shorten the name to El Do and it’s also been known as The City of Gold, The Wonder City, and Spring City. Before El Dorado Springs was an established community Osage Indians brought their sick and wounded to the healing waters on which the town was founded. Early settlers became familiar with the spring and its healing properties and soon a town bloomed and blossomed into one of the most desired tourist destinations in the Midwest. This splendid spring water was shipped all over the world, and thousands of health seekers sought relief in the spas and hotels featuring bath houses that sprang up shortly after the town was founded in 1881. To protect the valued “aquatic gold” the land around the main spring was designated as the city’s park [host to the area’s largest annual event ~ Founder’s Day Picnic]. Vernon County was organized in February 27, 1855, after two attempts to divide Bates County and is named for a popular and southern sympathizer State Senator Miles Vernon. In 1857 the first two-story courthouse was constructed; in 1860 a separate clerk’s office was built; and both were burnt in 1863. In 1868 the second courthouse was finished, which was sold in 1906. The present courthouse was built from 1906-1908. The earliest settlers were discharged soldiers from Fort Scott. The US government issued land warrants to honorable soldiers that fought in battles, essentially giving them a 80-160 acre homestead. The county, like others, stored their records in neighboring states during the Civil War for safe-keeping. • Nevada Area Originally known as Fair View and Hog-Eye. Fair View was all ready in use by Fairview (in Cass County). It was renamed to Nevada City after Nevada City, California. The “City” was dropped during the 1869 incorporation. Nearly the entire town of Nevada and other parts of Vernon County were burnt by the Union Army on May 23, 1863, along with other lawless activities. The jail and several houses was all that avoided the hard struck destruction. thank you for this information. I would like to assist in updating some of the names and businesses in your website – I’m located in El Dorado Springs and some of the information is outdated. Please call me if you need assistance with this. If you could point out any businesses that have closed -or- new ones that have opened along the route, that would be of great assistance.